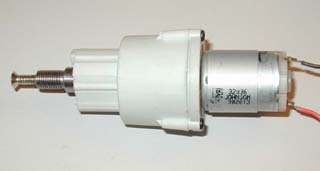 The Handiworks Drill motor and gearbox is a popular drive system component for 12 pound robots. Originally available at Walmart for $17, they were eventually discontinued. However, they have shown up again at several Walmarts across the country for $10. We've used them successfully in a number of 12 pound bots (IO, AP2, Solaris, Gemini). We've tried to collect the most relevant data for these motors here. The data below involves some estimation on our end, so it should be taken with a grain of salt. 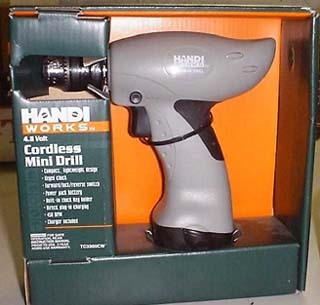 Removing the motor and gearbox is straightforward, similar to many other cordless drills. Check out Mike Konshak's description at www.RobotDojo.com under the "Lessons" menu. The Handiworks do not have clutches, so there is one less step to worry about. The batteries that come with the drill are cheap, low current cells, not suitable for robot combat. Some people save them for testing purposes, we recommend using "real" batteries for this. "Safe" current: ~10A, higher with cooling. 7.2V: 675rpm, 22.5in-lb up to 4" wheel. 8.4V: 787rpm, 26in-lb 3.5" wheel. 9.6V: 900rpm, 30in-lb 3" wheel max. The motor with the sheath on has a diameter of ~1 1/8". A 1 1/8" hole saw can be used to easly make motor mounts. The gearbox is the most common point of failure. The pins on the carrier in the output stage tend to shear off. The gearbox is nearly identical to many inexpensive cordless drills, and they often can be used interchangeably. Replace the low quality reverse-threaded screw with one from DeWalt service centers. We thought the part number was 605256-01, but we may be wrong. Order at your own risk.